Enzymatic Therapy BP Manager combines clinically studied ingredients known to lower blood pressure. This proprietary blend includes dandelion, olive leaf, and hawthorn berry, along with lycopene, a potent antioxidant with proven support for heart health. Why use herbal ingredients to support healthy blood pressure? It's the safe, natural way to care for your heart. Specific herbs have been studied and clinically-proven to help support heart and circulatory health. Because this proprietary herbal blend features five powerful, clinically-studied ingredients. Lycopene supports arteries, circulation and heart health. Recent studies showed positive results when consumers used BP Manager daily over an 8-week period. One tablet three times daily with meals. Notes: Caution- Monitor your blood pressure regularly. Consult your healthcare practitioner prior to use if your blood pressure is outside the normal range, if you are taking blood pressure lowering medication or other prescription drugs, or if you are pregnant or nursing. BP Manager=Positive Results! Take the pressure off naturally! 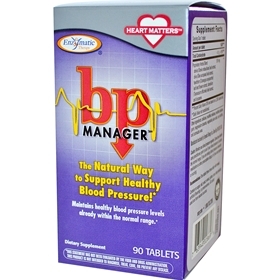 Take control with BP Manager, your first step for maintaining healthy blood pressure, naturally. Other Ingredients: cellulose, modified cellulose, modified cellulose gum, magnesium stearate, vegetable juice color, soy lecithin, and carnauba wax.